At Winasun, we have combined innovative quality healthcare products with a network marketing system which gives more to our distributors and eventually our consumers. Its use of multi-level marketing allows Winasun to get its product directly to the people who need it most whilst at the same time giving an ordinary individual the ability to build an independent business with minimal financial risk. A distributor is a person that has enrolled with the company, wishes to build Downline(s) and participate in the compensation plan. Distributors pay wholesale price for product. Refers to positions in the genealogy below a specific income centre in the genealogy. Refers to positions (distributor) in the genealogy above a specific income centre in the genealogy. Refers to an income centre’s first level of Downline. An income centre is a position in the organization that can build Downlines and participate in the compensation plan. A customer is a person that wishes only to purchase product at retail price from the company. Customers are not eligible to build Downlines or receive commissions. Customer volume is added to that of the sponsoring income centre during commission calculations; customers do not occupy a position in each level of Downline. Stands for Commissionable Value or Commissionable Volume. CV is the value of a product that qualifications and benefits are calculated off of. For instance, if there was $100 CV present on a level of Downline and the percentage to earn on that level was 12%, the total amount paid on that level would be $12; (100 * 0.12). Stands for Personal Volume. PV is the sum total CV purchased by a particular income centre and that income centre’s personally sponsored customers in the current commission period. Income centres are considered Active when they have PV of greater than zero in the current commission period. Active status is used for compression purposes only. Refers to the process whereby inactive income centres are temporarily removed from the Downline for the purpose of commission calculations. Active income centres in the Downline then roll up to occupy the positions vacated by the inactive centres. Fiscal periods define start and stop dates for each commission period. Winsun utilises monthly periods. Each monthly period will begin on the first calendar day of a month and end on the last calendar day of that same month; e.g. March 1 to March 31. Levels refer to layers of Downline. Those income centres that an individual is the placement sponsor of comprise the first level (or frontline). Those placed under one’s own frontline comprise the second level and so forth and so on. An income centre’s own volume is not counted as being in any of its Downline levels. Customer volume is applied to that of its sponsoring income center in order to determine the position/level in the Downline that it falls in. A rank is a name that represents the achievement of qualifications and benefits within the compensation structure. Income centres must meet the necessary qualifications to receive benefits associated with a rank each and every commission period. If an income centre has met the qualifications for a rank in the past, but does not meet the necessary qualifications in the current commission period, that income centre will be demoted in rank. If an income centre earned a higher rank “last commission period” but does not meet the qualifications for that rank “this commission period”, the income center will be demoted in rank and paid commensurate with the qualifications met in “this period”. There are currently 3 ranks in the system – Bronze, Silver and Gold. To enrol you must join one of the ranks. An enrolee purchasing one of these packs will be able to use it, in part, to advance to certain ranks within the compensation plan. Stands for “Stock Keeping Unit”. SKUs are the items sold within the system. An unlimited width compensation plan is one that does not restrict the number of income centres that can fall on any distributor’s first level of organizational Downline; this Unilevel is an example of an unlimited width plan type. 1. Retail/Wholesale Bonus (Retail Profit) – Whereby distributors keep the profit based on sales, which is the difference between the retail and wholesale price of SKUs purchased by their own customers. 2. 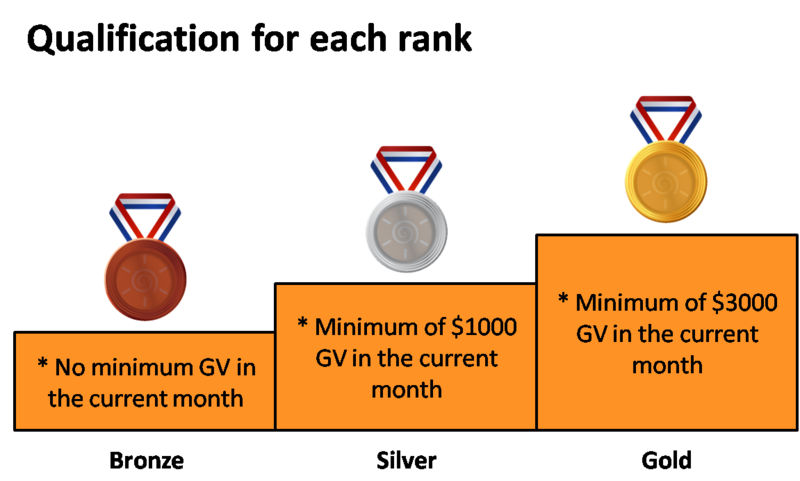 Levels Based Bonus – Whereby distributors receive levels based percentages on the CV present in their compressed Downline in the current monthly commission period. The actual percentages by level can be seen in section 3.